Sino Forest reported poor results , blamed Authorized Intermediaries for a lot of the confusion, whatever that means. 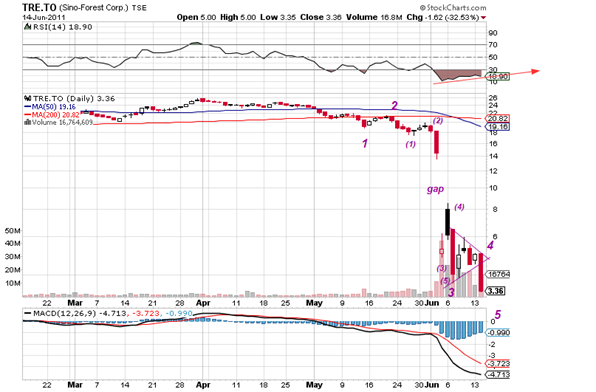 Anyhow the stock dropped another 32 % and now it looks like a buy! From a high of $26 to a low of $3.35 is quite a drop; more importantly it follows a very countable 5 –waves down signaling that a rebound of sorts should occur imminently. A bounce could take the stock to $6 or higher which would be a double of you can pick it up for ,say, $3.